Volkswagen has unveiled the facelifted Polo which will be available to order from April with the first cars arriving in July. The exterior and cabin get minor revisions but it's under the bonnet where the big changes occur with a range of new, more economical engines. New to the Polo is a 1.0-litre MPI petrol engine that's fitted in the Up. There are two versions with 60PS or 75PS and they replace the existing 1.2-litre petrols. Alongside are two 1.2 TSI four-cylinder units with 90PS or 110PS. The impressive 1.4 TSI with cylinder deactivation in the BlueGT model gets a power increase to 150PS while a more powerful Polo GTI is due in 2015. 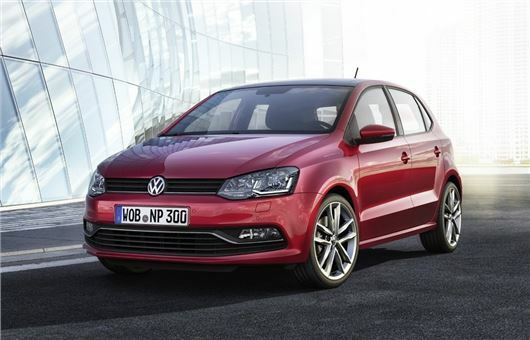 The other big news is that the Polo BlueMotion is changing from diesel power to petrol. The 1.2 TDI has been dropped in favour of a turbocharged 1.0-litre three-cylinder TSI engine with 90PS. This averages a claimed 68.9mpg with CO2 of 94g/km. The diesel range sees the 1.2 TDI and 1.6 TDI dropped in favour of two new three-cylinder 1.4-litre TDI engines with 75PS and 90PS. Other changes include a new electro-mechanical steering system designed to improve efficiency and offer more precise control. The interior gets redesigned instruments and a new steering wheel, plus a revised centre console with new heating and ventilation controls. Volkswagen’s modular infotainment system, already seen on the Golf, is being introduced across the Polo range. This touchscreen system includes a proximity sensor and a function that reacts to swiping movements like a smartphone. The exterior revisions are minimal with new lines on the front bumper and grille plus optional LED headlights. At the back there are new lights and a new bumper, while five new alloy wheel designs complete the look. All revised Polo models will come with an Automatic Post-Collision Braking System as standard which automatically brakes the vehicle after a collision to minimise the chance or consequences of a second impact. A new optional Sport Select suspension system is available which uses electronically controlled dampers to switch between two suspension settings.